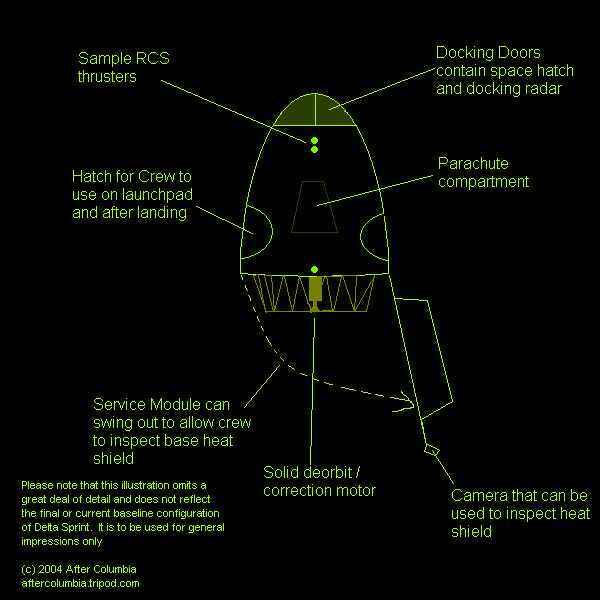 A no-frills 3 person capsule intended to be operational 3 years from "go" and be the safest piloted spacecraft to date. This is the basic report for "normal" people. Clicking on chapter titles will lead to the technical details. Delta Sprint is a three person crew transfer and bailout vehicle. It is designed to get three crew members to the International Space Station and back. Later models can be used to transfer crews to interplanetary spacecraft such as Mars Direct, and also to allow them to return from their missions. Using the Delta II launch vehicle and Fregat upper stage, the Delta Sprint follows a practice of being able to be developed on the faster, better, cheaper principle put forth by Daniel Goldin, and is to the best of After Columbia's current knowledge, the first piloted spacecraft concept to do so. Use of existing hardware and tactics ensure a simple, robust development that can be done quickly. In the first few days and weeks after the STS-107 catastrophe, no one could be sure that the cause of the disaster could be fixed and the Shuttle could be returned to flight. After Columbia's first goal was to address this possibility. At first the craft was called simply "Sprint" because it would be needed fast and on the cheap. "Sprint" was expanded into a program ( http://aftercolumbia.tripod.com/library/id2.html ) to address all the needs of the International Space Station on the fast and cheap; Delta Sprint is one of its elements. The spacecraft, wherever possible, uses off-the-shelf subsystems, with backups and simplicity provided where they are best suited to simplify development and enhance safety. Delta Sprint is a three person crew transfer vehicle. The ogive Descent Module is best summarized as a cross between those of Gemini and Apollo and is somewhat larger than that for Soyuz. The Service Module is a latticework truss structure topped by an aluminum impact shield shaped like a shallow wok to fit the bottom of the Descent Module. 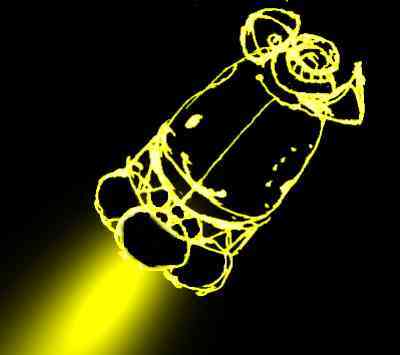 In the center is a solid deorbit motor, flanked by three propellant tanks, bottles, batteries, and electronics. Below that, on the Standard model, is a Fregat upper stage, which looks like six oversized bubbles arranged in a circle with little boxes, thrusters, antennae and structural fittings sticking out. The main rocket at the bottom is quite small compared to most other stages. The Service Module and Fregat are protected by a fairing that extends up to the bottom of the Descent Module. The abort rockets are strapped on to the Descent Module either on the top and bottom (as the crew sits) so that they do not cover the side hatches, or around the nose (haven't decided which yet.) The Delta II rocket below the partial fairing is identical to that which was used to launch the Mars Spirit rover in summer of 2003. The Delta II used to Mars Opportunity used slightly larger strap-on boosters and is also being considered for a version of Delta Sprint without the Fregat. Delta Sprint Standard plans to ascend on a modified Delta II rocket with a Starsem Fregat added as a third stage. The Fregat assists in ascent and performs several maneuvers to help rendezvous the spacecraft with the International Space Station or other docking target. The Fregat is jettisoned before docking and deorbited into the Pacific Ocean. After Columbia's Summary: Our spacecraft concepts are intended to provide a 99.99% probability that you will survive the mission. If the mission is not completed 99.99% of the time, abort systems are used to bring your odds of survival up to 99.99%. After entering the atmosphere, Delta Sprint uses a parasol similar to the one used on X-38, and will cushion the impact with the ground using airbags. The craft is not intended to bounce like a modern Mars lander, The airbags are intended to deflate on impact similarly to the ones used in vehicles to protect the driver and passengers from injury and death in car crashes. Delta Sprint uses a layered approach to protect the crew from landing system failure, primarily as a concern for damage to landing systems resulting from thermal protection system damage or poor entry attitudes as a result of guidance failures. These combination failures are addressed in Delta Sprint because there is little comfort to astonauts saved by backup tiles if all they have to look forward to is dying in a crash. As emphasized elsewhere in this report, Delta Sprint uses existing off-the-shelf systems wherever possible to complete its mission. The Descent Module will be constructed of an aluminum-copper alloy and will contain the most reliable systems currently available. The Service Module contains the most hazardous systems, including the solid fueled deorbit motor and orbital maneuvering engines. The Service Module has the ability to swing out to allow spacewalk or remote inspection of the thermal protection designed to protect you during the fiery return to Earth. The prospect of total guidance failure is only barely survivable and would no doubt be terrifying. To prevent this, the guidance system uses three computers, two of which need to fail before there is a major problem. The intent of Delta Sprint is to use existing, off the shelf components and technologies wherever possible, including and existing, proven reliable launch vehicle. Not all systems used for Delta Sprint need to be flight proven in space in order for this to take place. Existing avionics hardware should be adaptable. Life Support components may be available from mine collapse survival shelters. The recovery mode has been proven in flight by X-38 to be feasible in a vehicle larger than Delta Sprint. Serious arguments against Delta Sprint will not be based on what it does but by what it does not do and will probably be most loudly voiced by those who ask for too much in one ship. Delta Sprint II 6 place LEO and Delta Sprint II 4 place Planetary configurations have applications and response in private and amateur space communities. The 6 place LEO configuration in particular meets the criteria for the America's Space Prize anticipated from Bigelow Aerospace, while the 4 place Planetary model may be used for PERMANENT and Mars Exploration missions. This report has not been fixed for quotation marks and apostrophes removed from uploads by Trellix Site Builder.